The front door leads into a spacious entry hallway, off which there are two double bedrooms - both with en-suite bathrooms and air conditioning. Further down the hallway is the bright and spacious living space, which comprises an open plan kitchen with dishwasher, integrated oven, large fridge/freezer, granite worktops and a door leading out to the pool and terraces. There is a spacious dining area and a comfortable lounge, with flat screen TV with some English channels including BBC1 and channel 4. From the lounge, a staircase leads up to the master bedroom with en-suite, air conditioning, panoramic sea views and a small balcony. From the living area, patio doors open onto a large glassed naya, with wonderful sea views and an additional dining space. 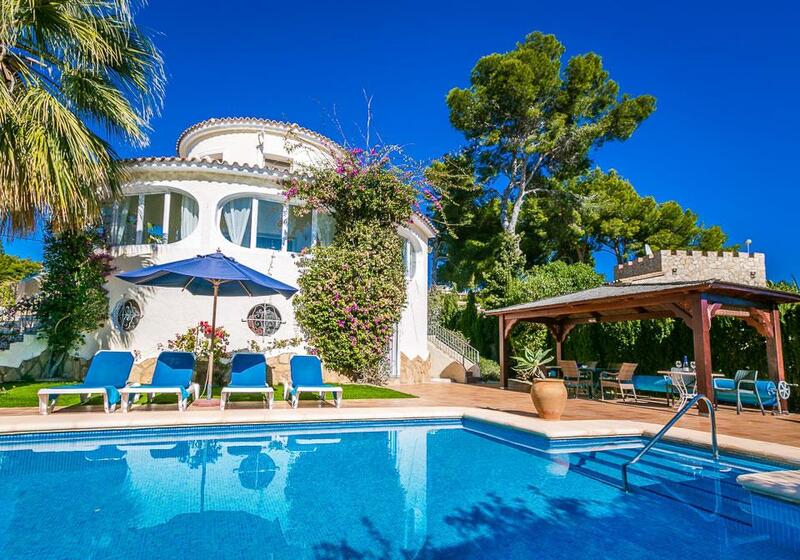 From here, you can relax and enjoy sea views stretching across the pool and on to Calpe in the distance. Stairs from here lead down to the pool level with the independent fourth bedroom, also en-suite with free standing electric fan, a double bed and its own access separate from the rest of the house. The swimming pool is larger than average at 11 meters x 5 meters with Roman style steps with a handrail, a poolside shower and sea views can be enjoyed from the pool terrace. High quality sun loungers and exterior dining furniture are provided, along with a gas barbecue, an umbrella for shade and a lovely sofa set to relax by the pool. There is also an attractive exterior pergola for more shade whilst dining al-fresco. Near the front door of the villa is another pergola with dining table and chairs where you can enjoy the sunset. A large gas barbecue (Broil-King) is also waiting for you. The house also features a washing machine, located in one of the bathrooms downstairs, as well as electronic entry gates. It is within short walking distance of several excellent shops, bars and restaurants and offers very elegant accommodation. Highly recommended. Please Note: Please read the above description carefully with regard to the layout of bedrooms and beds provided as in some cases it is necessary to hire an additional folding bed, linen and towels to achieve the full capacity stated. Our folding beds are normally suitable for a child up to 16 years of age. When you make your booking, if you need the extra bed(s), please choose it from the list of extras available in the booking process. We had a fabulous holiday, Direct Villa Holidays are amazing!